A 69-year-old woman with invasive ductal breast cancer (BC) presented multiple asymptomatic alopecic areas of the scalp. Trichoscopy revealed peripheral black dots (BDs) and an atypical vascular pattern. Histopathology confirmed the diagnosis of BC metastases. 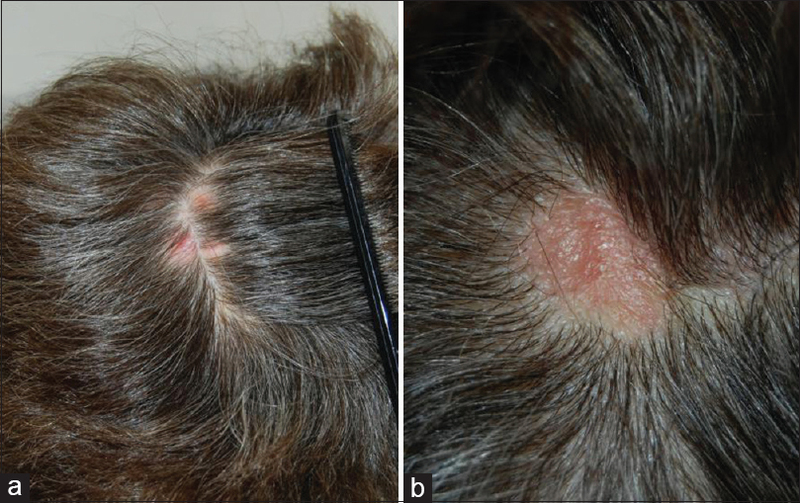 Cutaneous and scalp metastases are a possible sign of advanced and widespread BC, and the diagnosis may be challenging. The trichoscopy of scalp metastases has never been described. BDs and an atypical vascular pattern in our case were a diagnostic clue. Breast cancer (BC) is the most frequent malignant neoplasm in the female population and is associated with a high mortality rate. Cutaneous metastases are a possible sign of advanced and widespread disease. Scalp metastases of BC are uncommon, and they may represent a diagnostic challenge and a warning signal, as they are associated with disease progression and recurrence after treatment. We present a case of scalp metastases by BC where trichoscopy showed characteristic features that can help a clinician in diagnosis. A 69-year-old woman with invasive ductal BC presented with a 3-month history of asymptomatic patchy hair loss. 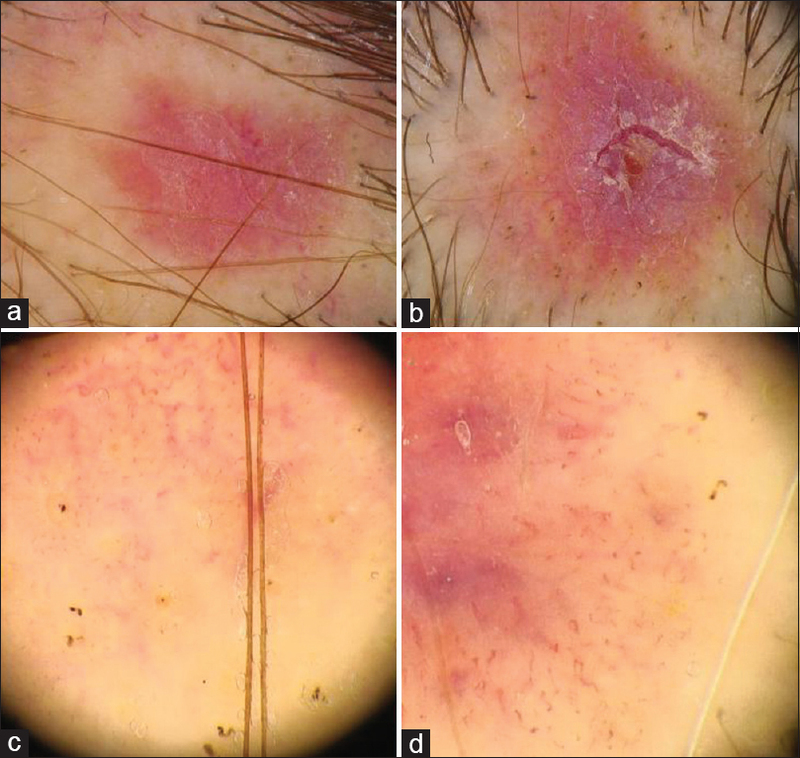 Clinical examination showed multiple, well-demarcated, nonulcerated, erythematous, 1–2 cm alopecic plaques of the scalp [Figure 1]. Trichoscopy revealed diffuse erythema and small erosions within the alopecic areas and peripheral black dots (BDs). Higher magnification (×40–×70) highlighted an atypical vascular pattern, with dilated, serpentine, and polymorphic vessels [Figure 2]. Histopathology confirmed the diagnosis of BC metastases. A positron emission tomography/computed tomography scan detected disease progression with visceral and bone invasion. Cutaneous metastases often mimic other skin lesions, such as malignant melanoma, cysts, pyogenic granuloma, and dermatofibromas. Trichoscopy of scalp metastases has never been described. Firm erythematous plaques, irregular vascular pattern with serpentine, and polymorphic vessels have been observed in cutaneous metastases. In our case, we had additional trichoscopic clues: hair loss and peripheral BDs. BDs are a nonspecific sign of acute follicular injury, seen in various disorders inducing anagen effluvium. They appear clinically as cadaverized hairs, trichoscopically as “macrocomedo-like” structures within the follicular ostium. Histologically, they represent remnants of hair shafts in the infundibulum and ostium of anagen follicles. We believe that scalp metastases should be included among possible causes of scalp BDs. Scalp localization is a harbinger in BC patients. Diagnosis is often challenging, and performing a biopsy is not always easy in these patients. The vascular pattern and BDs on trichoscopy may improve diagnostic accuracy and differentiate scalp metastases from other conditions, such as alopecia areata. Skin biopsy and full-body instrumental staging are mandatory to confirm the diagnosis and guide treatment. Ubillos N, Vola M, Mazzei ME, Magliano J. Pigmented cutaneous metastasis of breast carcinoma mimicking a melanoma. Actas Dermosifiliogr 2016;107:699-701. Costa RL, Costa-Filho RB, Rosa M, Czerniecki BJ. Occult breast carcinoma presenting as scalp metastasis. Case Rep Oncol 2017;10:992-7. Chernoff KA, Marghoob AA, Lacouture ME, Deng L, Busam KJ, Myskowski PL, et al. Dermoscopic findings in cutaneous metastases. JAMA Dermatol 2014;150:429-33. Rugo HS, Melin SA, Voigt J. Scalp cooling with adjuvant/neoadjuvant chemotherapy for breast cancer and the risk of scalp metastases: Systematic review and meta-analysis. Breast Cancer Res Treat 2017;163:199-205. Kowalska-Oledzka E, Slowinska M, Rakowska A, Czuwara J, Sicinska J, Olszewska M, et al. 'Black dots' seen under trichoscopy are not specific for alopecia areata. Clin Exp Dermatol 2012;37:615-9.